More on the Classic Flame Fixed Front 23 inch Electric Fireplace Insert with Remote (Black) 23EF023GRA below. 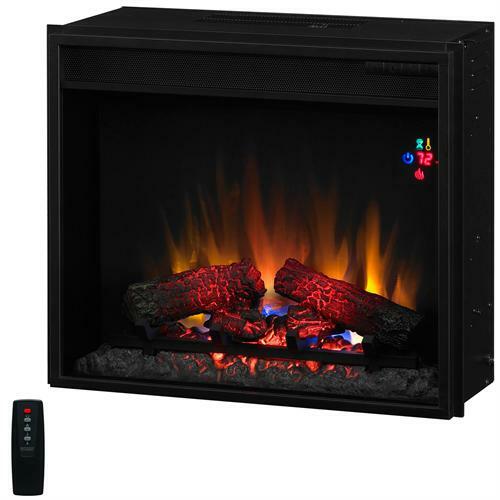 The Classic Flame 23EF023GRA 23" Electric Fireplace Insert with Backlit LED Display features energy saving LED technology with on screen indicators for remote or manual controls. No venting or gas lines are required to install this unit! Since this unit can be used with or without heat, you can enjoy this unit all year long and create instance ambiance in any room of the house. Realistic flame effect operates with or without heat for use in every season. Plugs into any 120 volt 3-prong electrical outlet. Energy-saving, all-LED technology -- no need to change the bulbs! NO fumes, smoke, carbon monoxide, carbon dioxide, emissions, standing pilot lights, and no pollutants of any kind. NO gas lines, wood, mess, clean-up, permits, or professional installation required. Safe-to-Touch glass, which remains cool whether heat function is on or off. Black frame glass front face with large viewable area. Upgraded Realistic Resin Logs and Ember Bed. 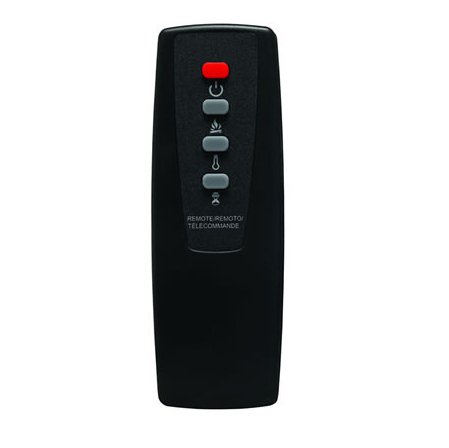 All effects can be operated manually from the insert or with the included slim-line remote. Function indicator lights up with each control/remote operation and then disappears after 4 seconds. Electronic timer function with automatic shut off from 30 minutes up to 9 hours. Digital thermostat with numerical readout. Flame Options: 5 flame brightness settings with SpectraFire flame effect or Traditional flame effect. Can be used with or without heat for 4 season enjoyment. 1400 watt/4600 BTU's per hour heater blower can warm a 400 square foot room. Cost efficient: Approximately 1 cent per hour without heat, and 11 cents per hour with heat. Classic Flame provides a one year limited manufacturer's warranty.